Comm Eye Health Vol. 28 No. 92 2015 pp 74. Published online 15 April 2016. Diabetes is a complex disease requiring the involvement of many health professionals. As a result, people with diabetes are faced with multiple appointments and multiple health messages to understand and make sense of. For example, blood sugar levels (and what is ideal), foot health (and warning signs), kidney checks and eye examinations. As eye care practitioners, we are faced with the challenge of trying to talk to patients – who are often without symptoms – about their vision in relation to their diabetes. We must encourage and support them to return for eye examinations and treatment (see page 68). Whenever diabetes patients come into our eye clinics, we can also support their overall health and diabetes treatment by offering suitable information, education and support. This is important as good diabetes control helps to slow down the progression of diabetic eye disease. Here are a few practical things we can do. Send regular reminders to other health professionals in the hospital or community to advise patients with diabetes about the importance of annual eye examinations and where to go. Discuss the variety of diabetes checks and clinics the patient attends and how often. Encourage patients to keep their appointments and stay in contact with colleagues in other departments, so you can give patients all the information they need. This will help them to obtain and keep appointments. Educate patients about how to stay healthy and manage their diabetes (see panel below). This slows down the progression of diabetic eye disease. Even if patients have heard this elsewhere, change takes time, and the education (and encouragement) needs to be ongoing. Educate patients about their individual situation. Use their own retinal images to show them any changes (without blaming them!) or use the poster on pages 70–71. The far right-hand column in the poster contains suggestions for how to talk to patients about what is going on, and what is likely to happen next. Making lifestyle changes is difficult. We must empower patients with information and support so they can take an active role in their own health – including coming for follow-up appointments and treatment. We can also lead by example by ensuring that we follow the advice below ourselves. Stable blood glucose (blood sugar). Healthy blood pressure, achieved by exercising and taking any prescribed blood pressure medication. A healthy weight and low cholesterol: Achieved by a combination of eating well and exercising. All these can be achieved by taking your medication as prescribed, by following a healthy diet and by taking regular exercise. Follow the tips below to make changes to your habits. Maybe start with one change a week! This will help to protect your eyes until your next visit. Take your medication regularly. Set an alarm (e.g. using a phone) as a reminder, or ask a family member to help remind you. Eat something just before taking your medication as this will reduce the likelihood of having an upset stomach. In order to keep blood glucose levels as stable as possible, pay attention to foods that affect your blood glucose – e.g. fruit, fruit juice, potatoes, rice, and so on. Eat three regular meals a day. Missing a meal, or doing more exercise than usual, can result in hypoglycaemic episodes (low blood glucose levels). This is characterised by shaking, pounding heart, nervousness, sweating, tingling, and hunger. If left untreated, it can lead to unconsciousness. 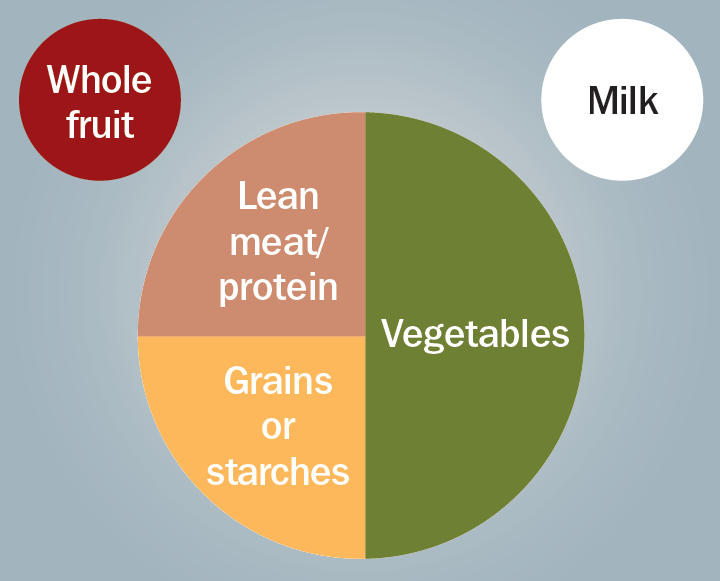 Plan meals that look like the plate in Figure 1: ½ a plate should contain vegetables (i.e., what you can hold in two hands), ¼ plate should contain starchy foods (i.e. the size of your fist) and ¼ plate should hold protein (i.e. the size of the palm of your hand). Some starchy foods/carbohydrates break down more slowly than others, and are therefore better for keeping your blood sugar stable. Where available, choose wholegrain or brown bread rather than white, whole potatoes rather than mashed, yams/sweet potatoes rather than ordinary potatoes. Eat a maximum of three portions of fruit a day – each portion at a different time of the day. Don’t drink more than one glass of fruit juice per day as they are full of sugars. Avoid sugary drinks, e.g. cola – drink plenty of water instead. Avoid alcohol as it makes hypoglycaemia more likely to occur. Alcohol can raise blood pressure and lead to weight gain. Sweets, biscuits and cakes can be eaten once in a while as a treat, i.e. once a week. Avoid fried foods – steamed or baked is better. Exercise helps to lower blood pressure, glucose and cholesterol levels, improves energy levels and general well being, and promotes weight loss. Exercising for 30–50 minutes at least 4-5 times a week is best, but you can start with as little as 20 minutes 3 times a week and build it up from there. Ask for advice from a doctor.